In CBT (Cognitive Behavioural Therapy) we work a lot with observing the thoughts in our head and how they contribute to our issues. The key principles behind CBT is that our thoughts directly create our emotions, which in turn dictate our behaviours and actions. So for example if you’re expecting a phone call from a friend and you don’t hear from them, the meaning you’re going to give to their silence will result in how you respond to the situation. If you immediately think that they’ve forgotten about you, and that they’re inconsiderate and don’t care about you – you are then likely to feel anger and you might pick up your phone and yell at them. If on another hand you think that they don’t love you because you’re not interesting, you may feel hurt or sad and as a result cry and numb your pain with alcohol or food. Those are random examples, I know, but they’re just to illustrate a process that goes on in our mind – extremely quickly – that we are most of the time not aware of. A situation happens, we think about it. We are wired to find answers, as human beings, as we struggle with uncertainty. So when we don’t really know what’s going on in a situation, or why someone does what they do, our minds automatically fills in the gap for us to try to make sense of that situation. That’s what we call in CBT creating meaning in a situation – as in, making assumptions in order to fill in the gap. Now most of the time we get it wrong anyway, as we are complex human beings and there’s always more to it than what’s visible to the eye. Have you found yourself in a situation where you made assumptions about someone or something, even got quite worked up about it, only to find out later that you were completely wrong? I have. And I also have been the “victim” of other people’s assumptions. Let’s face it. We all are. We all make assumptions, and we are all victims of other people’s assumptions. I believe this is one of the main reason behind misunderstandings and more generally conflicts and tension between people. Especially in relationships. I love listening to what’s going on in my head. I make so many stories about why such and such said that, or what it must mean, what they’re doing in their head…it’s very entertaining. No need for TV anymore! But it is only entertaining until I start to get caught up in them. The minute I start to believe what I’m telling myself I’m trapped in my own mind. And that can go on for days or even weeks of believing the stories, then feeling bad and behaving ineffectively such as entering the drama triangle or getting into my child ego state in TA terms…and most of the time, that doesn’t even solve the problem!! Do you find yourself in similar situations? That’s why I love CBT. It gives amazing tools to regain the control of those stories. Now it’s not a magic tool. It demands a massive level of awareness – as in order to stop the process, you need to be aware of the inner voice in your head and what it says all the time. And that’s unrealistic. Because of the speed of thoughts, a lot goes unnoticed. But that’s ok. We’re only human after all. What’s important, is to practice having the awareness. Practice becoming aware of this inner dialogue, and explore if it serves us, or if on the contrary it undermines us. I often call this voice the inner critic. The voice that keeps saying “you’re not good enough“, or “you’re lazy“, or “I can’t believe how stupid you are!” That voice that we’ve learnt earlier on in life, most of the time, that lives in our head 24/7 and keep being nasty. Recognise it?! So the first step is to become aware of that voice. Meditation and mindfulness can really help on that. And then, we need to question and challenge what it says. Most of the time the stories we make are not even true! They just reflect our fears or our insecurities based on past experience. They tend to be predictions of what might happen, or assumptions of why things are this way. But they are extremely rarely factually true. So why get all worked up about something that is only possibly true? Why sabotage our relationships and create problems in our lives based on assumptions? shouldn’t we instead find out what the facts are before gear up into action? The problem in believing our stories, is that they have a huge impact in our lives. 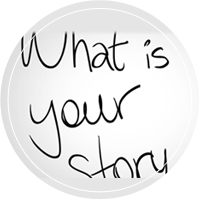 Have a look this week – how many of the negative emotions you’ve felt are the result of the stories you’ve told yourself about someone or a situation? How many of those stories are actually true…?! Who would you be if you didn’t believe your stories?